A 14-week-old English bulldog that two men were allegedly attempting to rob from a couple in Hemet on Tuesday, Jan. 16, 2018. 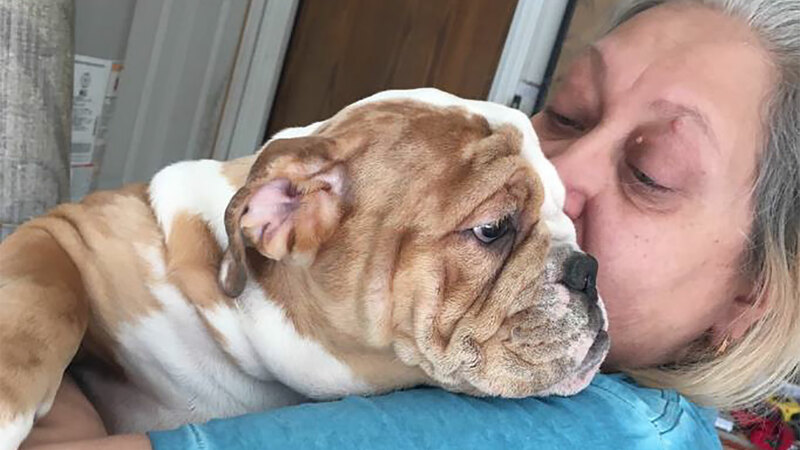 HEMET, California -- Two men are in custody after allegedly robbing a couple at gunpoint for their 14-week-old English bulldog in California, police said. Hemet police responded to a frantic 911 call on Jan. 16 from a person saying they were robbed at gunpoint by two men inquiring about purchasing their puppy. The owners had posted an ad for the sale of the dog and got a call from an interested customer. Two men later arrived at the victim's home in the 2000 block of Janae Way. Police said the men playing with the puppy while discussing the purchase when one suspect ran out of the house with the puppy in hand. Jorge Leos, 20, and Alfonzo Leos, 20, were arrested on charges of kidnapping, robbery and assault with a deadly weapon. The other suspect pointed a handgun at the victim and her husband and threatened both of them to stay in the house. The armed suspect then ran out and got into the driver seat of a Toyota Camry with paper plates. The victim's husband ran after the suspect with the puppy, while the victim attempted to stop the other suspect from leaving in a Camry, police said. Out of fear for the puppy's safety, the woman got into the passenger seat of the suspect vehicle. The suspect then drove off with the victim, traveling in the same direction as the other suspect. A neighbor on the street also chased after the suspect, who eventually dropped the puppy and continued running. The neighbor stopped and picked up the puppy to ensure it was unharmed, at which point the husband diverted his attention to the victim being driven away by the suspect. The husband attempted to stop the Camry and grabbed onto it as the vehicle slowed down, then the suspect stepped on the gas, which caused the husband to fall to the ground. The suspect drove the victim down the street to a nearby parking lot where the other suspect was waiting. The victim was pulled out of the vehicle and both suspects drove away. On Jan. 24, Hemet police found the Camry and conducted a traffic stop. Officers later identified the uncooperative driver as Jorge Leos, who was positively identified as one of the suspects in the robbery. He was arrested on numerous charges, including kidnapping, robbery, and assault with a deadly weapon. Just days later, through further investigation, detectives positively identified Alfonzo Leos, a relative of Jorge Leos, as the other suspect involved in the crime. Alfonzo Leos was found in La Puente and also arrested on similar charges.